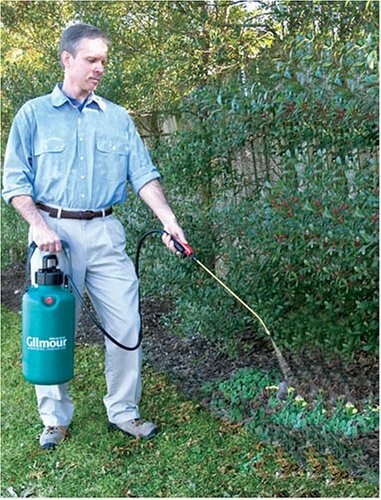 The Gilmour polyethylene premium 2-gallon compression sprayer is ideal for applying herbicides and insecticides. This sprayer features an extra wide 3-1/4-inch mouth opening for easy fill and cleaning, an 18-inch rotating brass wand with adjustable brass nozzle, and a translucent polyethylene tank for easy monitoring of fluid levels. The tank has an actual capacity of 2-1/2 gallons with an operating capacity of 2 gallons. This sprayer comes equipped with a pivoting carry handle and two wand storage clips. Heavy-duty 18 inch rotating brass wand with adjustable brass nozzle; wand storage clips on pump handle and carrying handle. Made in USA. I am handicapped so I put sprayer in basket on elec scooter. I can almost use entire 2 gal without recompressing. It has a long reach with connector tubing & nozzle so I can spray about 8' or 9' from elec scooter. I bought this sprayer, because of the extra handle on it... You are not carrying it around by the cap. It also has brass hardware and not plastic and is super durable. Very Very pleased.